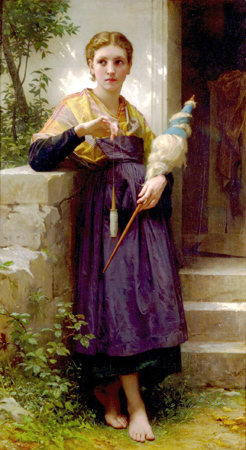 The famous painting “The Spinner” by William Adolphe Bouguereau depicts a woman hand-spinning by means of a drop spindle. Her left hand contains a distaff which the fibers to be spun are bound. All I can say is thanks to the industrial revolution for inventing industrial hand wheels. This spinning is just far too labor intensive, I’m just sayin’. NextRoy Kirkham China and Box Cutters huh?